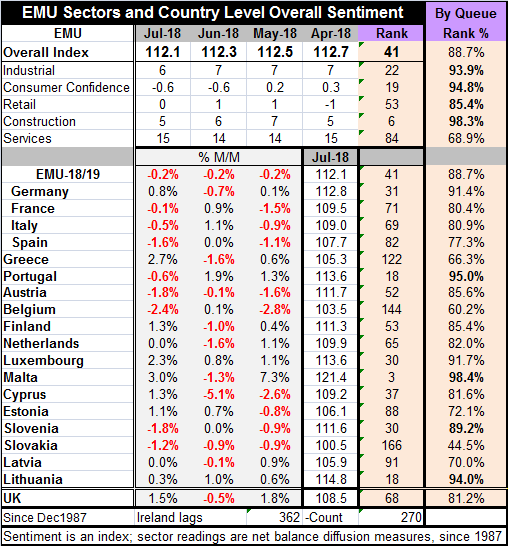 The EMU indexes, compiled by the European Economic Commission, show still highly elevated rankings by country although there has been very little change amid what has been steady erosion in the overall EMU index since March of this year. The overall index fell to 112.1 in July from 112.3 in June. The EMU indexes peaked in this cycle in December, edged lower, then stepped down sharply in March, and have since seen no abrupt changes. The overall EMU index has a queue ranking in its 88th percentile and has been higher less than 12% of the time historically. The EMU construction sector has been this high or higher less than 2% of the time. The industrial and consumer confidence readings are both higher only about 5-6% of the time. These all are very strong readings, but they lack momentum. The most moderate reading, however, is an important one from the services sector which is the job growth sector. The services sector has a still moderate and positive ranking in its 68th percentile and has been better less than 32% of the time. It is just over the border of being a top one-third reading. The sector components on the month were mixed leading to a small decrement in the overall index. The service sectors ticked up by a notch on the month, along with retailing that moved to a neutral reading albeit on with a high ranking. Consumer confidence was unchanged while the industrial and construction sectors each slipped by a single point. It was a month of modest sector reshuffling. Looked at by country, there are 18 of 19 countries reporting (Ireland is chronically late). Nine countries show month-to-month declines in their respective overall indexes of economic sentiment. This compares to 10 showing declines last month and 10 the month before that. In July, there are in addition two countries with unchanged readings and only eight countries with improved readings on the month. There are five countries with queue standings for their sentiment readings in the 90th percentile or higher. There are six with rankings in the 80th percentile decile (from 80% to 89.9%). There are no readings in the 50th percentile decile and only Slovakia has a reading below its median in the 40th percentile decile. All in all, there is solid and broad-based strength in the economic readings, but there is a lack of upward momentum. On the month, Greece, Cyprus, Malta and Estonia – all small countries had significant gains. Among the big four economies, Germany gained in July, reversing a slide of similar magnitude in June. France, Italy and Spain all slipped month-to-month. On a broader timeline, all the big four economies are doing better over a 12-month period, but only Italy is doing a lot better. Over six months, each of the big four economies is doing worse. Over three months, three of four are doing worse with only Germany doing slightly better. Looking at the EMU sectors over these broader horizons, we find that all of the sector metrics are improved over 12 months, except for retailing; that sector shed three points on its index. Among the sectors improving, only construction was up very strongly, gaining seven points on its index over 12 months. Over six months, all sectors are weaker with the construction sector as an exception again; this time it is unchanged. Over three months, there are declines in the industrial sector and in consumer confidence. Services and construction are unchanged over three months. Only retailing is higher on balance over three months. Looking at 12-month change, the overall country indexes of sentiment the 12-month gains generally show their peak gains around September. Of course, gains, but smaller gains, continued past September until the peaked around December in level terms, as noted above. No matter how you slice and dice it, momentum has cooled and been lost. But EMU countries do experience relatively solid levels of activity across most members and in all sector metrics. However, central bankers would feel better having momentum since changing monetary policy generally affects momentum. It bears noting that the EMU is doing well partly because all the stimulus programs that were or are in place. If the ECB starts to dismantle these programs, will the lack of monetary stimulus impact momentum adversely and reduce the EU Commission level readings that right now are solid? What is the role of current stimulus in achieving current economic success? Is it necessary or is it excessive? Those are things that the ECB worries about. Others are simply worried about the longer term impact of such ongoing stimulus and central bank dominance of markets, especially the securities markets. That is more of an issue in Europe where the securities markets are not as vast and deep as they are in the U.S. There is still a lot to keep your eye on in Europe.